Hey, we made it to the Transformer movie yesterday and it was AWESOME!! The way they left it......there will be #3 I'm sure!! I wanted to let you all know about some wonderful blog candy over on Anna's blog here. Check it out.....She is being so generous!!! since I hadn't posted in so long. 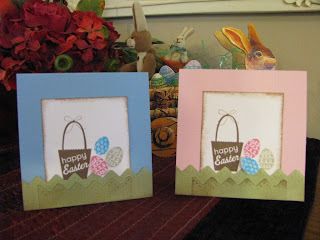 Here were my kids Easter cards this year. Pretty simple but I liked how they came out. Used a Studio G set here paired with one of my favorite EK Success border punches that I find myself grabbing all the time especially for those "man" cards. Hope you all have a great weekend. We are going to try to finally make it to the new Transformer movie...we've promised and still have yet to make it there. So, if you've seen it.....don't tell me about it!! 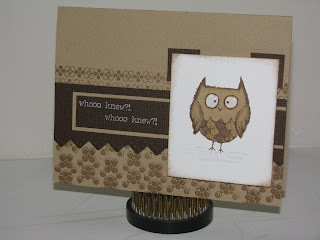 When I attended the annual TAC seminar a couple of weeks ago in Wichita, this NEW stamp set was one of my favorites in the new catalogue called Be Square (set of 5 owls and 3 sentiments). And you know what? Those that attended received this set while there!! Mischelle Smith wanted to give the seminar attendees one of her "favorite sets". Whahoo!! I couldn't wait to use this cute set when I got home. This card was made for my father-in-law's birthday. Do you notice the shiny eyes? I used crystal laquer on them. Mr. Owl was colored using my SU markers that I've had for eons and the background is Background Basics: Spots and Dots from...you guessed it!! PTI!! Do you see that border punch? This is one of my favorites in the EK Success line. It is so versatile and it embosses!! Well, what do you think? Need to get your hands on one of these owl stamp sets? Email me and I can make it happen!! I am still a demonstrator for TAC and would love to show the new catalogue to you!! A couple of months ago, I decided to break down and purchase the PTI Desk Top Organizer Timeless Template(I think of it as a stationery set). I really like the idea of using these; however, my printer doesn't take PTI cardstock very well so I've had to adapt and make an original and trace. Anyway, these turn out sooo cute!! This particular set was made for a friend of mine who graciously lent me her Twilight series books to read (which BTW were awesome). I wanted to thank her for letting me read them. Here I used the PTI stamp set called Friends til the End. 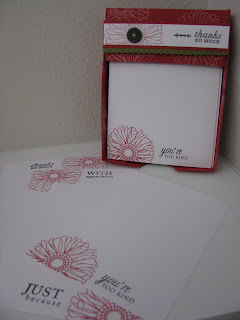 I love the look of the flower stamped "off" the paper some and paired with Mega Mixed Messages to the side. Something else I love is that Fresh Snow ink on Pure Poppy cardstock!! It just shows up so nicely. I think I made 4 different note cards and added envelopes. 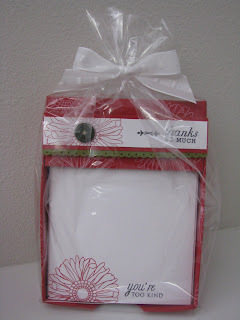 Here is a pic of how I packaged this gift. Yes, I'm talking PTI......Their release is tonight and I've had my eye on a couple of sets the last couple of days during the project release on the PTI teams blogs. 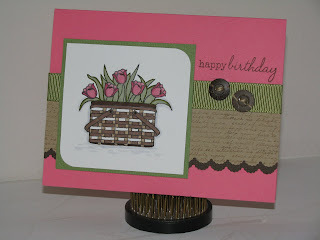 So, to prepare for the release, I thought I would post a card I made with last month's release Vintage Picnic for my sister-in-law. I am very happy with how this turned out. I absolutely LOVE these stamps.....I know I've talked about my obsession to a few "stamping friends" but now I've come out of the closet!! Have you checked them out yet? You know where I'll be at 10pm tonight....checking out the sets in their entirety and then at 11pm ordering that is to say if I don't get called into work! I hope to join a couple of friends on MSN/Yahoo (if msn doesn't work....wink Laurie) to visit about the release! Thanks again Laurie for helping me with MSN!! See you all tonight!! Paper: some PTI and other is from my "stash"
Just a very quick post today before my family comes for the holiday. We so enjoy shooting fireworks (none of the big gun stuff) and have now since moving to Topeka where they literally sell them on every corner!! 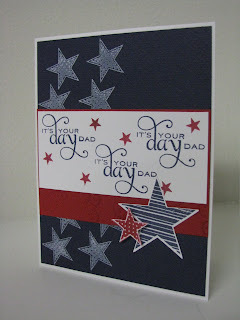 I didn't get my 4th of July cards made (again) this year but here is a patriotic card I made for my father-in-law for father's day this year. Jessica if you read my blog......I loved your 4th of July card!! Let me tell ya, this girl makes and sends cards for ALL holidays!! Even Nurse's Day!! It's always so nice to get one of her creations!! Anyway, here is my card using.....you guessed it.....all PTI stamps!! 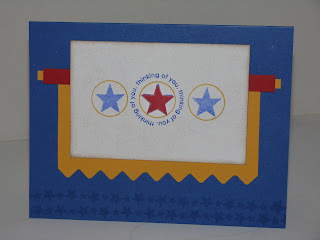 (Let Freedom Ring, Star Prints, and Everyday Classics) Star Prints is one of my FAVORITE stamp sets.....you can punch out the stars using the TwinkleTwinkle Fiskars star punch!! Any questions....email me.